The hashtag #PasDeVague was launched on Twitter following a student’s broadcast of a video of a violence scene in the classroom, and the ” hashtag # against the lack of support from the hierarchy during the difficulties experienced by teachers facing students. . As for the “red pens” , this Facebook group born in response to the silence of Emmanuel Macron on the teaching condition in its response to the movements of “yellow vests”, they call more widely to a financial but also symbolic recognition of the profession. Why do teachers feel that their daily work is so negated? Why does the institution and the unions fail to revalue it? When asked by questionnaire about the reasons for their “discomfort” , as did the Evaluation and Foresight Directorate in 2004 – a consecrated expression that is not very helpful and that I prefer to put in the plural – “the absence of taking into account the real difficulties of the trade” is the first reason invoked. Of these difficulties, the closed session of the class is an essential place because it leaves most often the teacher in solitude, in front of all the relational cyclothymies and incidents more or less serious to manage. But these are also, as listed in the “red pens angry”, the invasion of administrative tasks, even evaluation tasks, the absence of occupational health, career prospects. Moreover, the name chosen, probably allowing a zero point to current policies, refers to one of the most invisible parts of the teaching work: the correction of copies. The lack of recognition is not new and has already been identified in many trade surveys. It results in the lack of attractiveness of which the sociologist Pierre Périer made an inventoryin a recent report. It can also be read in the wake of this “denial of the real work” that Christophe Dejours pointed out in his time as a cause of suffering . When certain speeches put the profession back on the statutory comfort of life and holiday employment, it is again this reality which is denied, at a time when, moreover, the increase of the number of precarious in the National Education renders in part obsolete images too fixed in this regard. But this is also the case when the teachers question the supervision or more broadly the reforms: the claim, made by the “red pens”, of a “minimum delay between the reforms” speaks volumes in this respect, in its moderation itself. What must be questioned then is the disjunction between the “solutions” that the reforms claim to bring and the daily work. In most cases they are experienced as additional problems, when they are not as reform-sanctions, to use the word of Michel Crozier , against a profession often described as individualist, “resistant to any change” , disregarding the extraordinary diversity of teachers and contexts. 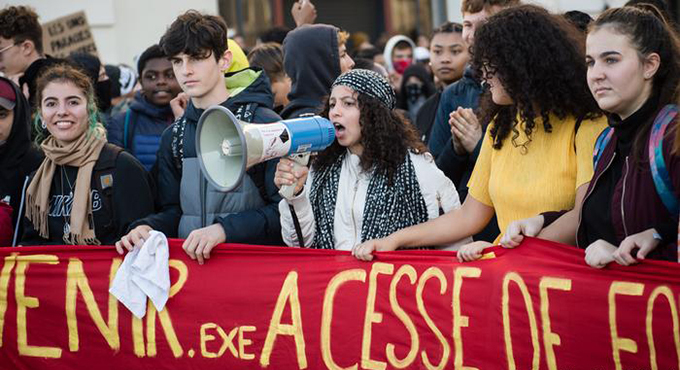 When school principals, inspectors or politicians do not realize this enough, they participate in this denial of recognition, even though studies like those of Françoise Lantheaume and Christophe Hélou show that teachers can both to protest against changes conceived outside them, and to appropriate what they find interesting on the scale of their own experience. This does not prevent the recognition of playing also in close relationships, with school heads, colleagues and especially students. Recurrent for many years, the demand for a drop in the number of students per class can also be read in connection with the growing difficulty of managing groups of children and adolescents, making the expert controversies about value of this decline in terms of results. This difficulty is not surprising in a society where relations between the generations are more egalitarian, and therefore sometimes more tense, without these problems always being at the heart of shared and constructive reflections in the professional context, each referring to its emotions and to his questioning or individual satisfaction. In this respect, the structurally weak aspect of the training of French teachers can only accentuate the situation. The arduousness of this profession comes largely from the risks of relational wear, it is also fully explained in this context. « Pas de vague » et « stylos rouges en colère » font donc réapparaître le travail enseignant, si vite recouvert en France par les débats constants sur l’école, la pédagogie, la laïcité, les réformes elles-mêmes. Bien sûr, ils n’en sont pas une photographie objective, et on peut avoir l’impression que disparaissent tous les enthousiasmes, dynamismes, et espoirs quotidiens d’une profession dont certains membres sont aussi exaspérés d’être décrits seulement au travers de leurs malaises. Here they are at least at the heart of an unprecedented search for mobilization, on the Internet, which, beyond the concomitance with the “yellow vests” questions also the state of the collective teachers. “No wave” reported a lack of support by the hierarchy, without mentioning the sometimes fragile state of teacher solidarity, yet yet we continue to talk about teamwork. The “red pens” take up a lot of union demands. By their very existence, they imply, however, that the latter are insufficient. The Internet collectives offer another level of action as well as that of the establishment, which in some cases is also heavily invested, managing to contain or take care of the difficulties of the profession. We can also notice that they are trying to build a convergence between the degrees, primary and secondary at a time when many reforms and devices fail to make it concrete, where the future reform Blanquer training could well put it back in question, and where unions continue to identify separately for each level. A job and a job more aware of their common contours, such could be one of the medium-term consequences of these speeches, beyond the rude and the desire to give teachers a real place in the world. social effervescence and current politics.